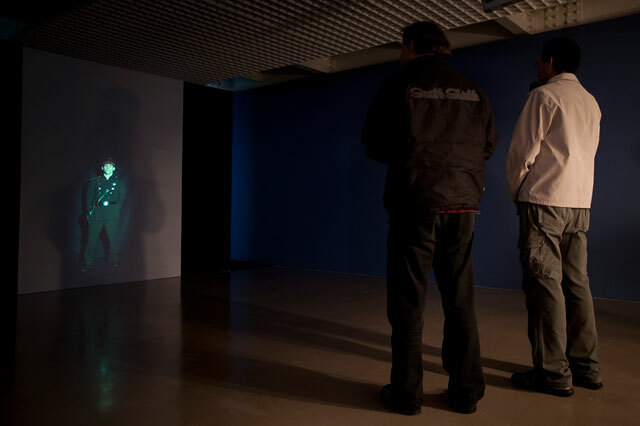 Authority is an interactive video installation where you face a policeman in the same proportion that you are thus; you are in the same level of power. The policeman starts to yell at you and to make lots of questions using its pseudo power. If you do not say anything, the policeman becomes bigger and bigger. This will continues until you start to yell back. According to the volume of your voice, the policeman's size begins to diminish. In this way, the power relation is equalized by the decibels. Picture: Ars Electronica Center Archive. According to Michel Foucault exists a wire of power among us. The power side changes constantly and every moment we can notice it. The authority project comes from an experience that I had at the beginning of 2006. I was in the immigration department of a European country trying to figure out what should I do to have a document. My first thought was that I should talk to the policeman that was in front of the door and ask him for information. When I went in his direction, he started to yell at me in his mother tongue. I was astonished because I was not able to say anything to him. So, my reaction was beginning to yelling in Portuguese (my mother tongue) at him. Afterward, he was calmer, and we could talk normally. I think this experience is deeply related to Foucault's idea of power, and how it is spread and can be suddenly changed. (1) Foucault, Michael. "Discipline and Punish: the birth of the prison." Vintage Books. New York, 1995.